Fact sheet of the Big Island of Hawaii. 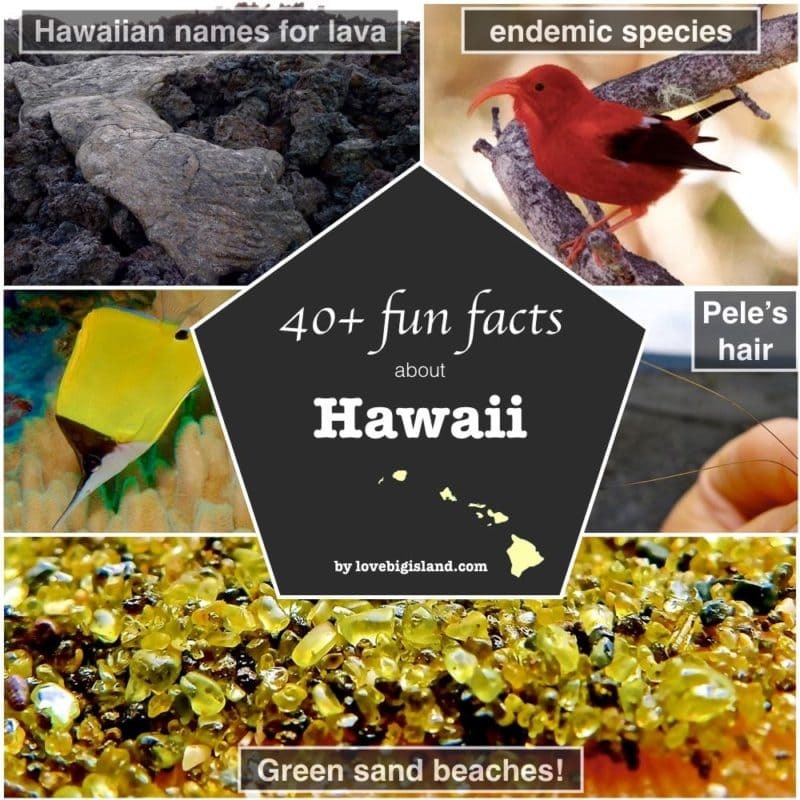 Learn about Hawaii and surprise your friends with the fun facts and trivia we have collected on the Big Island. You can test your Hawai’i trivia knowledge (before or after reading this page) and find out if you are “Da BIG Kahuna” by taking our 5-minute Hawaii Quiz. 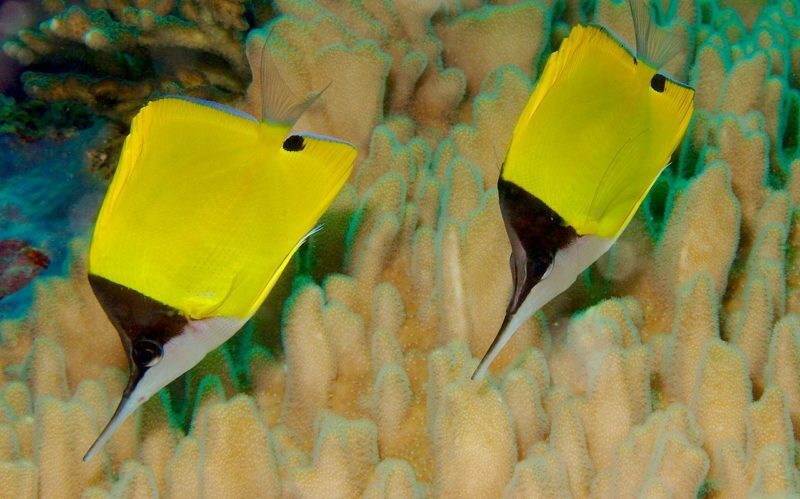 The Lauwiliwilinukunukuʻoiʻoi (longnose or foreceps butterflyfish) is the fish with the longest Hawaiian name.The fish are monogamous and easy to find. 90% of all native species in Hawaii are endemic if you only count the native species that live on land. 50% of *all* native species on Hawaii are endemic. Lake Waiau is a lake just below the summit of MaunaKea on the Big Island of Hawaiʻi at an elevation of 13020 ft. Mythological and Scientific background. Pāhoehoe and A'a are two different kinds of lava rock. You can find both on the Big Island of Hawaii. Differences, similarities and the Hawaiian translation. Fun trivia and facts of pineapples. History of the pineapple, how  came to Hawaii, why  are called "Hala kahiki" and why "Pizza Hawaii" might be Hawaiian..
Facts, trivia and pictures for the Hāpuʻu (Hawaiian tree fern). Medicinal use and how to eat Hāpuʻu, as well as a Hawaiian proverb that features this plant. Kahili ginger is a beautiful but invasive plant originating from eastern India. It is not edible and can be found in forests on all Hawaiian islands. Dig a hole through the earth starting in Hawaii, and you would come out on the other side of the planet in Botswana in Africa. These are Hawaii's antipodes. Pele's hair are thin strands of volcanic glass drawn out from molten lava. You can find this hair of Pele all around the Hawaii Volcanoes National Park. Aloha means many things, including: love, affection, compassion, mercy, sympathy, pity, kindness, sentiment, grace, charity, greeting, salutation, regards, sweetheart, lover, loved one, to love, to be fond of, and many more things. It is commonly used as a greeting or a way to say goodbye. Are you here for Spam? You must be from Hawaii, we love that stuff! (click the spam-url for more spam trivia). The aloha shirt, a shirt with exotic designs, became fashionable in the world in the 1980s. These Hawaiian shirts were worn by superstars such as Richard Gere, Bob Barker, Timothy Hutton, Jack Nicholson, and Paul Newman. Hawaii is the 50th state of the USA. By a legislative act, Hawaii became officially known as the “Aloha State” in 1959. An antipode is a person that lives on exactly the other side of the planet. The antipodes for all Hawaiians except those living in the north of Kauai are people living in the country of Botswana in Africa (see the pictures to convince yourself). The antipodes for people living in the northern part of Kauai are Namibians (from Namibia). The air force bombed a lava flow that threatened Hilo in 1935 but failed to stop it. Read more Hawaiian facts and trivia about the volcanoes in A Short History of the Big Island in 5 Volcanoes. Always close to a beach! While on the Big Island you will never be farther than 28.5 miles away from a beach. Better yet, 30% of the surface of the Big Island is within 5 miles of a beach! (source). Did You know that the famous British explorer Captain James Cook died on the Big Island during a struggle with the native population? This happened in Kealakekua Bay (also nicknamed Captain Cook) in 1779 A.D.
Nowadays, Kealakekua Bay is a favorite destination for snorkeling and diving on the Big Island that should not be missed. More birds have become extinct in Hawaii than in any other part of the world. A total of 26 species died out and 27 more are endangered by changes in their natural habitats, forest destruction, rats, mongooses, and man. Endemic to Hawai’i means that you cannot find it at any other place in the world. 90% of all native species on Hawaii are endemic if you only count the native species that live on land. 50% of *all native* species on Hawaii are endemic, and 40% of *all* species are endemic. Pretty cool! Read more of such cool facts (e.g. 99.5% of tree snails are endemic!) in our comprehensive guide to native and endemic species on Hawaii. Green sand beach is one of the two green sand beaches in the United States, and one of the 4 green sand beaches worldwide! It gets its color (and name) from olivine crystals that wash out of a 49.000-year-old cinder cone next to the beach. Other names for this beach are Papakolea and Mahana beach. Find out why on our dedicated “Green sand beach trivia page” [including pictures!]. The Hāpuʻu or Hawaiian tree fern (Cibotium menziesii) is what gives many places on Hawaii that “Jurassic park” feel. It also has medicinal use and features in a Hawaiian proverb about famine and death. Curious? Find out more at our dedicated “Hāpuʻu trivia” page. Island flowers and colors are used to represent each island.The Island Flower of the Big Island is called the “Pua Lehua”. It is the red blossom of the ōhiʻa lehua tree and is intimately connected to an interesting Hawaiian legend. The Island of Hawaii has many nicknames, so be careful not to get confused. If you hear people about the following islands, they all talk about the same island. The current official Hawaiian alphabet consists of 13 letters: 5 normal vowels; A, E, I, O, U: 5 Vowels with Macrons; Ā, Ē, Ī, Ō, Ū: and 8 consonants; H, K, L, M, N, P, W, ʻokina. The ʻokina is an apostrophe which represent the glottal stop. Despite this limited amount of letters, Hawaiian know some proper tongue-twisters, such as the state fish called “humuhumunukunukuāpuaʻa” or the lauwiliwilinukunukuʻoiʻoi. The state fish of Hawaii is the humuhumunukunukuāpuaʻa. Translated from Hawaiian it means “triggerfish with a pig-like short snout”. It’s name is pronounced as “who-moo-who-moo-noo-koo-noo-koo-ah-pooah-ah”. The humuhumunukunukuāpuaʻa has not, as often claimed, the longest fish name in Hawaiian. That distinction belongs to lauwiliwilinukunukuʻoiʻoi (“long-snouted fish shaped like a wiliwili leaf”). The Ironman Triathlon was moved from Oahu to the Big Island in 1981. It runs now between Kona in the East and Hawi in the North. Kahili ginger is very pretty and an invasive species originating from eastern India. ‘Kahili’ is a Hawaiian word for a feather standard or a long pole decorated at one end with a cluster of feather plumes, which is a symbol of royalty and is/was used as a ceremonial emblem in Hawaii. This plant is probably one of the first to catch your eye if you are visiting Volcano Village or the Hawaii Volcanoes National Park, but can be found in forests on all Hawaiian islands. Kailua means “two seas” or “two currents”. It is a contraction of the words kai (meaning “sea” or “sea water”) and ʻelua (meaning “two”). There are two cities on the Hawaiian islands called ‘Kailua’. The biggest Kailua is on the windward side of O’ahu, while the smaller lies on the leeward side of the Big Island. Because in the Hawaiian language, ‘leeward’ means ‘kona’, Kailua on the Big Island is also referred to as ‘Kailua-Kona’. The Kilauea Volcano is one of the most active volcanoes in the world – and it has been active for a long time! The Hawaiian name “Kīlauea” means “spewing” or “much spreading,” probably in reference to the lava flows that it already erupted in ancient Hawaiian times. Just below the summit of MaunaKea, inside a cinder cone, is Lake Waiau. This is the only glacial lake in the mid-Pacific, and, at 13,020 feet above sea level, it is also one of the higher lakes in the world. In recent years its volume is fluctuating a lot. By November 2013 it held less than 1%(!) compared to its pre-2010 volume [source 1], while as per mid-2015 it refilled almost back to historic levels [source 2]. You can find more in-depth information on, and pictures of, lake Waiau, at our dedicated Lake Waiau Trivia page. Like many other things, lava flows on Hawai’i have their own pace. The fastest recorded flow recorded here was the 1950 Ho’okena ‘a’a flow of Mauna Loa which advanced down a 5º slope through thick forest at approximately 10 km (6 miles)/hour [source]. The fish with the honor of having the longest Hawaiian name is the lauwiliwilinukunukuʻoiʻoi. Freely translated this name means “long-snouted fish shaped like a wiliwili leaf”. This fish indeed has a HUGE snout, and is also monogamous! You can find out more about this interesting fish and tongue twister extraordinaire in our extended lauwiliwilinukunukuʻoiʻoi trivia article. The Big Island is the youngest Island of Hawaii, but that will change in the future! As the island moves away from the hot spot responsible for the Hawaiian Islands, a new Island is already forming 15 miles southeast of the coast of Big Island: Loihi. The summit of Loihi has already risen by two miles, and it still has one mile to go until it breaks the ocean surface. In another 30 or 40 thousand years, Loihi will be born as the youngest of the Hawaiian Islands! The Loco Moco is a dish native to Hawaii. It consists of white rice topped with a hamburger patty, a fried egg, and brown gravy, but there are many variations. These include amongst others: chili, bacon, ham, Spam, kalua pork, Portuguese sausage, teriyaki beef, teriyaki chicken, mahi-mahi, shrimp, oysters, and other meats, Big Island Grinds can tell you more. The longest river in the state of Hawai’i is the Kaukonahua Stream on Oahu, which is 33 miles long. The second longest river is the Wailuku River on the Big Island. This river starts high up Maunakea and takes 32 miles to reach the ocean. Mauka (mow-kah) means on the mountain side in the context of directions. Makai (mah-kigh) means on the ocean side in the context of directions. These words are used very frequently and without a further description in Hawaii. So, now you’ll know when you go what these words mean and you’ll be navigating like a local. There are several words for a meteor or comet in the Hawaiian Language: Koll, Akualele, Hokulele and Hoku Welowelo. Leiepio means “To fly, as a meteor through the sky”. You can learn more about Meteors in Hawaiian culture here. The Mahukona volcano is the oldest and the northernmost volcano of the Big Island of Hawaii. Its existence was predicted in 1890 but it took scientists up to 1987 (almost 100 years!) to confirm this. You can read more about the Mahukona volcano (and the 5 other volcanoes that are, have been or will be part of the big island) on our Big Island Blog. How “Big” is the Big Island? The Big Island might be “big” compared to the other Hawaiian islands, but, in reality, it is quite small. From the southern tip to the northern tip it measures a mere 93 miles, while the distance between the extreme points on the east side and the west side is 76 miles (source). The surface of the Big Island is 4,029 square miles (10,433 km2). There are two different kinds of hardened lava you can encounter on the Big Island: Pahoehoe (pronounced ‘pah hoy hoy’) and a’a (pronounced ‘ah ah’). The surface of a’a lava is very sharp and rough, while pahoehoe lava surfaces are more smooth. Pictures, a video, and more information in our in-depth Pahoehoe and A’a article. Pele’s hair is not real hair from the Hawaiian goddess of fire Pele. Instead, it is the internationally recognized name for little strands of lava glass that are created during ongoing eruptions. Read more about Pele’s hairs (including picture). Pidgin (or Hawaiʻi Creole) originated as a form of communication used between English speaking residents and non-English speaking immigrants in Hawaii. Almost all locals weave pidgin in their everyday (English) conversations, so try keeping your ears open. If you want to look up a couple of phrases, here is a good place to start. Ask anyone what they think when you say “Pineapple”, and they will almost certainly say “Hawaii”! Pineapples have for long been a symbol of Hawaii, but they do not originate from there. Pineapples are native to South America and made their way to Hawai’i via a detour to Europe sometime between the 16th and 18th century. Read more about the history of pineapples on Hawaii, about how Hawaiian a “pizza Hawaii” is, and at least 5 other pieces of interesting pineapple facts in our special pineapple fact sheet. Between 1983 and 1991, lava flows repeatedly invaded communities on Kilauea’s coastal south flank burying eight miles of highway and destroying 181 houses and a visitor center in Hawai`i Volcanoes National Park. When Captain Cook first landed on the Hawaiian islands in 1778 he named them the Sandwich Islands. Not because he was so happy he could finally get some proper food, but after his Patron, the 4th Earl of Sandwich. Spam (the food, not the unsolicited emails) is very popular in Hawaii. More spam is consumed on Hawaii than in any other state of the USA. One popular local snack is “Spam Musubi”. Because it is so popular here, you can find “exotic” spam versions in supermarkets on Hawaii, such as Honey Spam, Spam with Bacon, and Hot and Spicy Spam. Some people even go as far as calling spam “Hawaiian steak”. Not us though. We prefer the local, pastured-raised steaks from cows on the Big Island! Mauna Kea on the Big Island houses some of the world’s biggest telescopes and has more scientific observatories in one place than anywhere else in the world. Read how you can see visit the telescopes on the summit yourself in our DIY stargazing guide for Mauna Kea. The state of Hawai’i is vulnerable to tsunamis. Since 1812, 24 tsunamis with a run-up of more than 2 meters (6.6 feet) have been recorded. Of these, the 1946 tsunami (see below) was by far the most devastating. In total, these tsunamis caused 291 casualties, the last ones as recent as in 1975 (source). Today there are elaborate early warning systems in place to protect against tsunamis. In 1946, a 54-foot (16.4 meters) tsunami swept over the east side of the Big Island sparking a national tragedy. This tsunami caused 159 deaths and a material damage of 26 million USD (347 million USD in 2017 when corrected for inflation). If you are in Hilo, you can still see the consequences because the houses closest to the bay have never been rebuild. If measured from east to west, the state of Hawaii is almost 1500 miles long. This makes Hawaii the widest state of the United States!! The large Japanese population of Hawaii has a very positive effect on the local food. Have you ever heard of Mochi? Mochi (little Japanese rice cakes) are now a very popular snack in Hawaii. For one of the best tastes of the Island, go to Two Ladies Kitchen in Hilo and ask for the Strawberry Mochi! The ukulele was made famous by Hawaiian music (think Israel Kamakawiwoʻole), but is not a native Hawaiian instrument – it is Portuguese! The ukulele came to Hawaii in the 19th century as a Hawaiian interpretation of the “cavaquinho” or “braguinha” and the “rajao”, a small guitar-like instrument taken to Hawaii by Portuguese immigrants. The amazing sea-cliffs found on the North of the Big Island (for example at Waipi’o Valley or Pololu) are most likely sculpted by a gigantic landslide some 200.000 years ago when part of the island slid into the sea. These valleys also contain two of our five favorite short hikes on Hawaii! “Wiki” (as in Wikipedia) is a Hawaiian word and means “Quick”. Did you know that Mauna Kea on the Big Island is the tallest sea mountain in the world and, if measured from the ocean bottom, is 4000 feet taller than Mt. Everest? More record-breaking trivia on the Big Island.